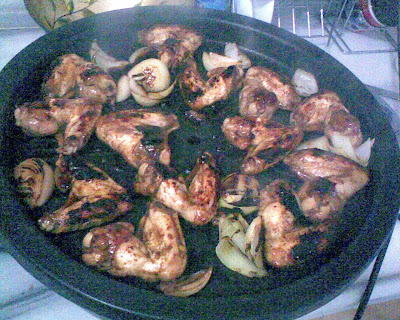 Teriyaki is a cooking technique used in Japanese cuisine in which foods are broiled or grilled in a sweet soy sauce marinade (tare in Japanese). Teriyaki is served in most modern Japanese cuisines. Traditionally the meat is dipped in or brushed with sauce several times before and during cooking. You do: Put all the chopped or sliced ingredients into a food processor or a simple blender. Blend it until the souce is smooth, without chunks. This recipe will make 3 cups of sauce which is enough to marinate about 1 kg of chicken or other king of meat. Another way: Buy a bottle of teriyaki sauce in a supermarket, pour over the meat and marinate it for at least 3 hours. Grill it!!! Enjoy!! !